Do you know an extraordinary woman who has gone beyond the call of duty to improve the health and wellbeing of people in their community? 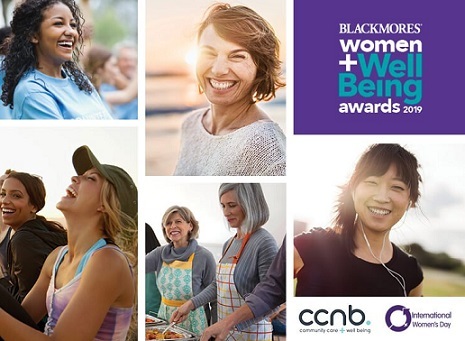 Nominate her now in the Blackmores Mercie Whellan Women + Wellbeing Awards 2019. Entries open until Sunday 24th February 2019. Winners will be announced at an International Women’s Day Gala Dinner on 7 March 2019 featuring guest speaker Sam Bloom, the 2018 Women’s World Adaptive Surfing Champion. Blackmores, Australia’s leading natural health brand, is running the awards in partnership with CCNB, trusted advisors in community health, aged care and disability. Community organisations play an essential role in supporting holistic wellbeing – including physical, mental, social and emotional health – helping to ensure that everyone gets the most out of life. StrongBeing: Everyday women who have shown courage and determination to overcome adversity in their personal lives and inspire others. Mercie Whellan WellBeing: This major winner will be selected from nominees across all categories. Winners will each receive $1000, with the Mercie Whellan WellBeing winner receiving $2000. These five winners will also be invited to join a leadership mentoring program, The Leader’s Room© to help enhance their personal and professional development and support the valuable work they are doing in the community. Nomination close 5pm on Sunday 24 February 2019 at midnight. Founded in 2018, the Blackmores Mercie Whellan Women+Wellbeing Awards are named after Sydney Northern Beaches resident Sister Esther “Mercie” Whellan, who trailblazed the path for women in health in Australia. She worked alongside Blackmores founder Maurice Blackmore in the 1940s and became one of the few female chairmen of that era.